One of the best things about growing your own fruit is that you normally get a far bigger harvest than you need. While it’s always good to share your fruits with friends and family, you also get the opportunity to turn your bounty into fantastic pickles, relishes, jams and preserves. Pickled food is delicious. The taste is often very far removed from the original foods source and so this gives another dimension to the fruit you grow. Pickles combine spices, sugar and vinegar to give your fruits a crisp, firm texture and tart, sweet flavour. What’s more, they retain some of the fruit’s original nutrients, they are low in fat, and are relatively low in calories (the sweet pickles have a higher calorie content). Chutneys are made from finely chopped ingredients, which are boiled with sugar and vinegar. They can be sweet or sharp and are usually served with cheese or cold meats. Jellies and jams are fantastic on toast and are easy to make. They have the added bonus of being suitable for fruit that is slightly overripe, when you can no longer freeze, dry or bottle it. The fruit is preserved by boiling it with sugar. The process of making jam and jelly is the same, the results depend on which fruit is used, how it is prepared and the proportions of the different ingredients used. Jellies take a longer time to prepare than jams and conserves. Often the seeds of the fruit are removed and the result is more clear and smooth. Jam is a cooked mixture of fruit or vegetables with sugar, which is boiled and stored in jars. The high sugar content prevents micro-organisms from growing and means the jam will keep for months. Marmalades are jams made with a citrus fruit such as oranges and lemons. These are similar to jams but normally the whole fruit is preserved in the mixture. The fruit is kept in jars in a thick syrup and boiled for a much shorter amount of time. The fruit is therefore preserved closer to its original state, both in its shape and taste. Curds are made using eggs and butter. An example is lemon curd. They are not strictly a preserve, and so keep for a much shorter length of time. Almost any fruit can be used to make a curd, including raspberries and blackberries. Vinegars and oils can be infused with certain fruits and can then be used for pickling, bottling or as salad dressings. Ketchup is made using vinegar and extracts from a single fruit or vegetable. For all preserves, except jams and jellies, use fruit that is slightly under-ripe. This is because pectin levels are higher in under-ripe fruit, so your end product will be firmer and ‘set’ better. 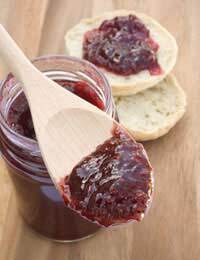 If you’re making jam with slightly over-ripe berries, however, you can buy pectin in powder form, or use the juice of a lemon, or apple in the mixture, which contain high levels of pectin. Use granulated sugar where possible. Caster sugar is also suitable, but brown sugar can stain the colour of the resulting mixture. Vinegars should be of good quality. Red and white wine and cider vinegars are particularly suitable. Use cider vinegar for pickling sweet fruits and red wine vinegar for pickling darker fruits such as plums (it will add depth to their colour). It is best to use mildly flavoured oils, such as sunflower. This ensures the flavour of the fruit with which it is being infused is not overpowered. Always store your pickles, jams and preserves in a cool dark place. You should be able to use your preserves right through the winter months and enjoy your fruit on toast, as an accompaniment to cheese and cold meat, or in oil or vinegar over a crisp salad. There are hundreds of uses for different preserves, and once you’ve got the hang of making them, why not experiment with different ingredients?